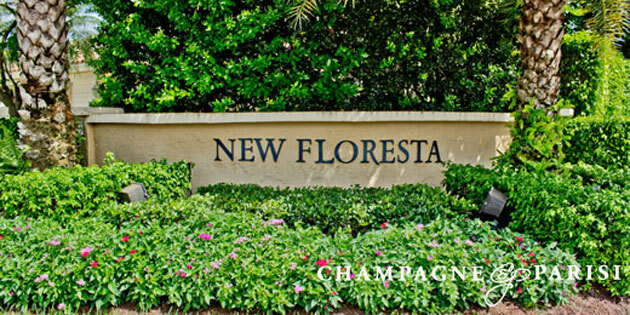 New Floresta is a fabulous non-gated community located in the heart of Boca Raton, FL. Situated on the west side of St. Andrews Blvd., between Glades Road and Yamato Road, this upscale neighborhood is encompassed by beautiful lush green landscape, colorful plantings, and sparkling lakes. Residents also receive cable service as a part of their homeowner fees, which also help to cover the cost of maintaining the neighborhood common areas. In addition to the diverse selection of luxurious single-family homes for sale, the New Floresta community boasts a great, centralized location that is just minutes away from some of the best that Boca Raton has to offer. The community is a short drive away from Mizner Park, Boca Town Center Mall, and the Boca Raton Museum of Art, and is just 6 miles from the beautiful local beaches. New Floresta is also convenient to many of the area's incredible dining venues, several natural parks, Gumbo Limbo Nature Center, iPic movie theaters, and the luxurious Boca Raton Resort & Club. I-95 and Florida's Turnpike are also located nearby, providing residents of New Floresta easy access to West Palm Beach, Ft. Lauderdale, and Miami. New Floresta is zoned for some of the best schools in the area making it a popular choice for homebuyers with school-aged children. New Floresta truly offers the best of both worlds, with residents able to take advantage of the tranquil, relaxing setting of this peaceful neighborhood as well as the exciting cultural atmosphere of Boca Raton and the surrounding areas. If New Floresta seems like the perfect place to call home, you may also want to visit similar single-family home communities in Boca Raton including Colonnade & Millpond, both of which offer a great selection of beautiful homes in an excellent centralized location. If you would like to learn more about New Floresta or any other single-family home communities in Boca Raton, FL, please call us at 561-998-9015. You may also reach us by completing the brief online contact form below and one of our expert agents will reach out to assist you. We at Champagne & Parisi Real Estate look forward to assisting you in finding your next dream home in Boca Raton, FL! Click to see all Boca Raton single-family homes for sale.